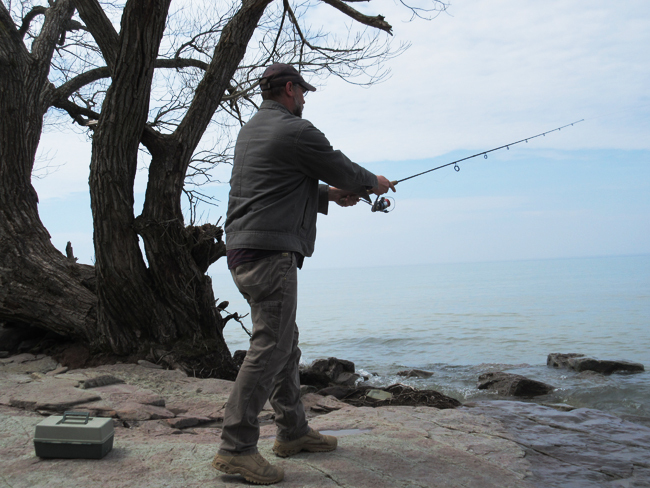 What Do Lake Ontario’s “Resident Anglers” Want? A NYSG-funded survey of 7,000 property owners in the seven counties bordering Lake Ontario in New York State was conducted to examine the relationships among motivations, constraints, facilitators, demographic and experiential characteristics, and fishing participation for resident anglers who did not have a preference for catching a specific fish species (i.e., ‘no-preference’ resident anglers). Understanding the relationships among these elements is important for fisheries promoters and business owners seeking to attract this large angler market. A total of 1,303 questionnaires were returned, 681 of which were completed by anglers; 210 of these anglers self-identified as “no-preference” anglers. Credit: Jesse Lepak/NYSG. Syracuse, NY, May 8, 2018 - Anglers who live close to Lake Ontario—a prime fishing destination in upstate New York and Canada—drop their lines in the region’s waters more often than just about anyone else. In fact, since these sportsmen and women are the most stable, reliable group of participants in the region’s fishing scene, people who study the industry gives them a name: resident anglers. While out-of-state angler activity has generally fallen over the past 20 years, resident anglers remain steady as weights on a line. It is unknown whether these trends are broader, but we do have evidence for New York State. The largest subgroup of these anglers—37 percent—are those who report no preference for a particular species of fish. In a study funded by New York Sea Grant, Kuehn and her team investigated what motivates and constrains the “no-preference” angler. Their findings are detailed in June 2017’s Fisheries Research. When you look at the body of research about the preferences of anglers, some have studied motivating factors such as why people fish—to spend time with family and friends, say—or to build skills and find challenge. In contrast, constraints limit peoples’ participation in leisure activities. Examples of constraints are the inability to access fishing locations, lack of time, or lack of support from family or friends. Whatever reasons people have for fishing, how much fishing they actually do is dictated by various factors. Most of these factors can be either facilitating or constraining—e.g., one can have lots or little free time for leisure. Kuehn and her team encourage fisheries promoters and business owners to focus on “facilitators,” or those factors that can build significant relationships, and get people out fishing. Although the “no-preference” anglers are fewer in number than species-specific anglers, they are the largest group of resident anglers, and are seen as important to the sportfishing industry. Negative perceptions of the Lake Ontario fishery do influence this group’s fishing participation. Identifying the “facilitating” factors such as internal motivations, commitment, and environmental perceptions can help fisheries managers and business owners ensure people are happily enjoying the fishing opportunities of Lake Ontario. Kuehn, D. (2017). “'I catch whatever’s biting! ': Motivations, constraints, and facilitators of no preference anglers residing along New York’s Lake Ontario Coast." Fisheries Research: 188–196.